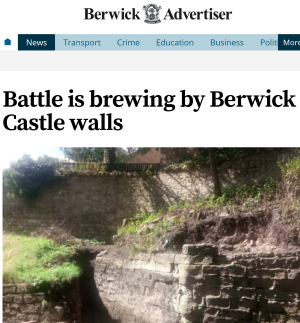 The Berwick Advertiser has reported on potentially unauthorised works to the scheduled monument of Berwick Castle. Parts of Berwick Castle which have been hidden away behind undergrowth for many years have been revealed. The walls of Constable Tower are now clearly visible after vegetation and earth was removed by the owners of Castle Vale House. Justin and Margaret Gudgeon say they carried out the work within their grounds to tidy up the area and make more of the castle’s remains visible. However, they appear to have fallen foul of planning regulations by carrying out works to a Scheduled Ancient Monument without first seeking the required consent. The couple, who have lived at Castle Vale House for a decade but only bought the property a year ago, decided to clear shrubs and bushes next to the castle walls, exposing stonework to the elements for the first time in many years. ‘We thought it was a good time to tidy up that corner which was covered in trees and ivy,’ said Justin. ‘The main thing, as far as we were concerned, was to get rid of the ivy which is tearing it apart.’ The couple met officers from Historic England and other interested parties on Friday to discuss the work that has taken place and what happens next. ‘We are arguing that it needs to be attended to but Historic England don’t want it touched,’ said Justin. ‘We think there is clearly an obligation on the owner of a historic monument to maintain them.